Oliver and Owen played some great games of tennis last weekend. 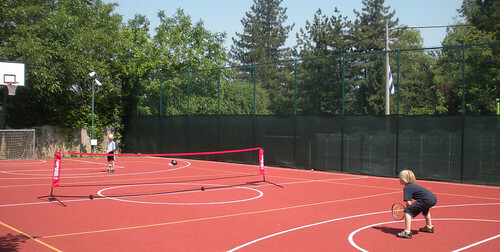 We brought the USTA “Quick Start” Tennis net and balls over to their elementary school. They played several great games. We are watching the highlights of the French Open and I’m getting them excited about tennis. Bill, we are seeking information on Charles Kralovec son of Colonel John Kralovec from Kemper Military School. I knew Colonel Kralovec, he was an outstanding guy and a real down to earth person. Enjoyed your blog. I’ll talk to my father, Charles Kralovec, the nephew of Colonel John Kralovec. I’ll get back o you if he knows anything. My daughter found this thread and passed along to me. My brother was John Charles Kralovec. He attended Kemper from 1945 – 1948. He started college, but then joined the Army during the Korean War. He returned to U of Missouri on the GI Bill. John was killed in an auto accident near Boonville, MO on 17 Jan 1986. My dad, John George Kralovec, retired from Kemper in 1970 and died of colon cancer in Sept 1974. No family left in Boonville. The family home on 6th St in Boonville is now a restaurant called “WJ’s”. I did not attend Kemper. High School at Boonville Catholic HS, then BS in Ind Engr at U of Missouri. ROTC commission in USAF. During my USAF career, I worked in the weapons acquisition side for 24 years retiring in Jul 1986 as a Colonel. Spent 16 years at DEC, Compaq and HP in the systems services LOB (all in Alpharetta, GA) retiring again in 2004. Do some consulting work these days, but mostly take care of our yard in Alpharetta, GA about 30 minutes north of Atlanta center. Moved here in 1988. Lived here longer than anywhere. Married my lovely bride, Sue, at Scott AFB (first assignment in AF) in Nov 1966. Moved many times across the country for next 20 years. Two children, Jay Andrew, who lived with his family in Viera, FL and Sara Duke, who lives near us. Jay and Joye had one living child, Andrew Neal (12), and Sara has two, Olivia Madeline (9) and Benjamin Warren (6). My e-mail is Joe.Kralovec@comcast.net. Would like to connect with both of you as you have time. Hope all is well in Wisconsin and Japan.